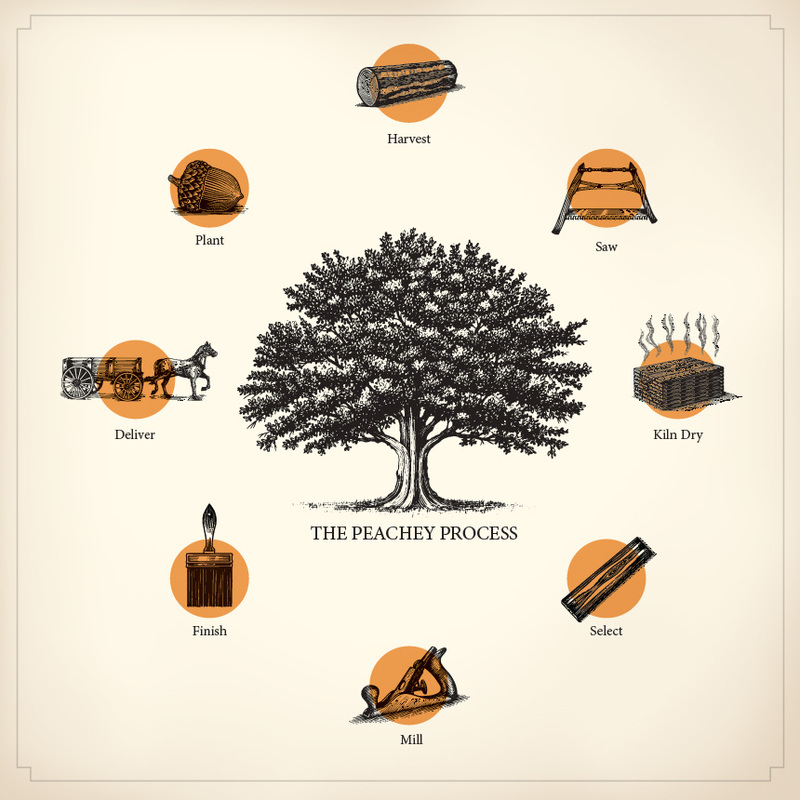 The Peachey® Process actually begins in America’s greatest old-growth hardwood forests, where Ash, American Cherry, White and Red Oak, Northern Hard Maple, Hickory and Northern Black Walnut grow strong. These are the trees harvested, cut, graded, dried, milled and finished by hand to become hardwood flooring that provides a lifetime of beauty and enduring performance. Through each step, we skillfully work to create the industry’s highest standard of flooring and stand behind every board we craft with our Peachey Promise – our guaranteed of quality, service, beauty and performance. The Appalachian Mountains are home to a variety of hardwood species that offer exceptional natural qualities perfect for hardwood floorings, casings, baseboards, cabinets, mouldings and doors. For centuries, the old-growth trees of this region have been transformed through the skilled hands of craftsman. And it’s here that we find the trees that will become the beautiful, premium flooring that carries the Peachey name. Every industry begins with raw materials — ours just happen to come from nature and the old-growth forests of the Appalachians. This is where we find our inspiration and utilize the amazing natural resources that surround us to create premium hardwood flooring. Choosing only the best hardwood trees to transform into the woodwork that beautifies great American homes like yours. By working closely with local Amish sawmills, where we source 90% of our lumber, we’re able to specify the perfect custom cut to produce the widest and longest boards in the industry for beautiful wide plank wood floors crafted to last through generations. At Peachey Hardwood Flooring, we slow dry each hand-selected board before they finish drying in our kilns using proprietary processes that reduce the stress normally found in fast-drying, high production lumber operations. This important step allows green lumber to dry naturally to ensure consistent moisture content and greater board-to-board stability throughout the changing seasons. Once each board is kiln-dried to exact specifications, our craftsmen carefully inspect them to be certain that each meets our demanding standards for quality and durability specific to every custom flooring order we receive. During this step of the process we mill each board to exceptionally tight tolerances for greater stability year after year and a guaranteed fit board-to-board to help cut installation times by as much as 20%. We appreciate that each customer comes to us with a unique vision of how our premium flooring will enhance their home. That’s why we offer a virtually unlimited collection of colors and treatments to finish your custom hardwood floors beautifully and create a look like no other. We proudly craft our premium hardwood flooring near State College, PA, with average lead times of just 2 to 4 weeks and guarantee on-time delivery directly to job sites locally, throughout the state of Pennsylvania or anywhere across the country.